The perpetual inventory system journal entries below act as a quick reference, and set out the most commonly encountered situations when dealing with the double entry posting under a perpetual inventory system. What is the Perpetual Inventory Method? The perpetual inventory method is a method of accounting for inventory that records the movement of inventory on a continuous (as opposed to periodic) basis. It has become more popular with the increasing use of computers and perpetual inventory management software. Although the perpetual inventory system can be more expensive and time consuming to maintain, it has the advantage that the accounting records always reflect the levels of inventory on hand at any point in time, allowing real time management of inventory. Under the perpetual inventory method each time there is a movement journals are processed to record the change. Purchases are debited to inventory and sales are credited to inventory, with the debit going to the cost of goods sold account. In each case the perpetual inventory system journal shows the debit and credit account together with a brief narrative. For a fuller explanation of journal entries, view our examples section. *It should be noted that for a perpetual inventory system, there is no end of period bookkeeping entry. This reference guide is for perpetual inventory system, if the business is using a periodic inventory system the journal entries are different and can be seen in our periodic inventory system journal entries reference guide. 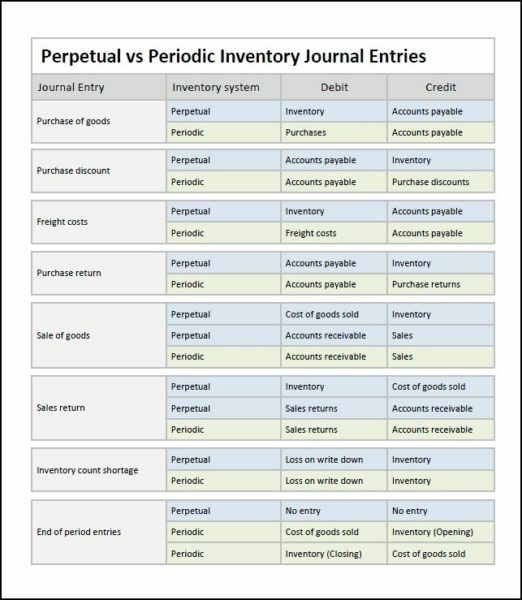 The perpetual vs periodic inventory system journal entries diagram used in this tutorial is available for download in PDF format by following the link below.